ORGANISED armed right-wing militias are committing “acts of terrorism” across Nicaragua, according to police, with violent attacks aimed at destabilising the country. 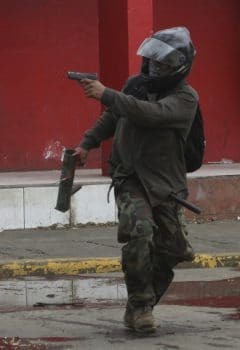 Officials explained that a number of small groups armed with firearms, mortar shells and Molotov cocktails, attacked Nicaraguans over the weekend, with violence spreading across a number of major cities. Criminal acts took place as gangs went on the rampage on Saturday and Sunday, according to a police statement, with a series of kidnappings, several deaths and damage to government property. Respect life, public and private property. A source in the city of Esteli told the Star: “Here in Esteli now the opposition are marking the houses of people identified as Sandinista. We’re all taking what precautions we can, but I don’t think the opposition are in the least interested in dialogue. They are determined not just to oust the government but to destroy the FSLN [Sandinista National Liberation Front]. A police guy was captured at four o’clock and is still being held after he was beaten up. Three police were captured outside Managua earlier and have been brought to Masaya for ‘interrogation’. “In the police station they only have rice to eat. We got someone to deliver some oil and salt and maybe some other stuff to help them out, but this is risky,” he explained. Anyone suspected of being police or a young Sandinista was being stopped at the roadblocks and attacked. “A council worker in neighbouring Niquinohomo was stripped naked and beaten up in the street last night,” the Masaya resident explained. Nicaraguan President Daniel Ortega has been leading attempts to secure peace and stability in the country since violence erupted in April. However, Nicaraguan right-wing extremists are seeking regime change with the government suspecting U.S. interference after the Trump administration made a series of threats against Mr Ortega. The president has initiated a national dialogue involving different layers of Nicaraguan society, backed by the country’s trade unions, official student body, Catholic church and civil society groups.